With Memorial Day, also known as the unofficial kickoff to summer, just around the corner, now is the perfect time to get behind the wheel of a new Nissan 370Z Coupe. The Nissan National Tent Event is underway and drivers can save big on the Nissan 370Z Coupe. Right now 2012 Nissan 370Z coupes start at $32,280 MSP. James Ceranti Nissan is also able to offer financing specials as low at 0.0% APR for 60 months for qualified buyers. Drivers not ready to buy can take advantage of great leasing specials instead. 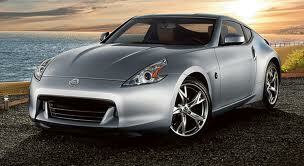 The 2012 Nissan 370Z Coupe can be leased for $329/month for 39 months with a $2,999 initial payment. The 2012 370Z Coupe is equipped with many luxurious amenities, including auto-off headlights, keyless start, leather wrapped steering wheel, trip computer, HID headlights, MP3 player, and climate control. Unlike the fun you’ll have in a new 370Z, these offers won’t last long. Hurry in to James Ceranti Nissan by May 31, 2012 to enjoy these special offers on the 2012 Nissan 370Z Coupe.